Workplace change is inevitable. As a species, however, humans tend to resist change. They will even sabotage initiatives on certain occasions. During times of necessary change, like during a merger or recession, this could mean the end of your organization entirely. If employees aren’t willing to get with the program, your entire operation may not withstand the changing work environment. As a result, your organization won’t be able to compete with other organizations that are innovative and adaptable to the new environment. Despite the reason for the changing environment, one thing is certain: your employees are your biggest asset. They will make the change happen if they are committed and engaged. This means they understand the vision and are involved in the execution process. The following strategies provide leaders with actionable steps to get team members on board to execute successful change initiatives. During times of change, it’s natural for leaders and team members to resist it. Frequently the “get it done” people will react to the situation immediately. The best thing everyone can do, however, is to wait and gather more information. The situation likely arose quickly. “Get it done” people instinctively follow their gut and make quick, reactionary decisions. These decisions likely won’t get to the heart of the situation. It’s more important to make the right decisions, which comes after carefully assessing the situation followed by creating an implementation plan. It’s also natural to want to make decisions on your own. However, when other people who also are impacted by the situation are recruited to the team, a system-wide solution can be developed. Surround yourself with co-workers who are trustworthy and knowledgeable. Take steps to ensure that they can be impartial and unbiased. An internal team will know what exactly you’re dealing with. By adding external team members, perhaps blind spots can also be brought to light and not missed. Any change will be initially met with resistance. This is because lack of understanding is involved. In the book, Working Together (Barrett Koehler 2003), Dianne Crampton introduced a formula for overcoming conflict, which change resistance is a form of. A business is essentially a relationship composed of leaders and employees who have come together to accomplish work. The relationship is impacted by conflict, which can be change, opposing ideas, misunderstandings and mistakes. Conflict is reduced by understanding and how quickly that understanding can be integrated. If understanding does not emerge and is not integrated the business relationship suffers because of change resistance. Therefore, change-resistance must be met head-on and in ways that improve understanding. In order for any initiative to be successful, you need to get your employees on-board as quickly as possible. It must make sense. It also needs to include a future vision of how work-life will improve once the change is normalized. This means that a catalytic change event needs to inspire vision and harness imagination. It must also enhance cooperative group processes by improving working relationships while minimizing uncertainty. A process for defining behaviors that build cooperation. A way to monitor the effectiveness of the group’s progress. An empowerment-based Action Plan that includes insights from employees. A process for monitoring milestones and reporting the results. 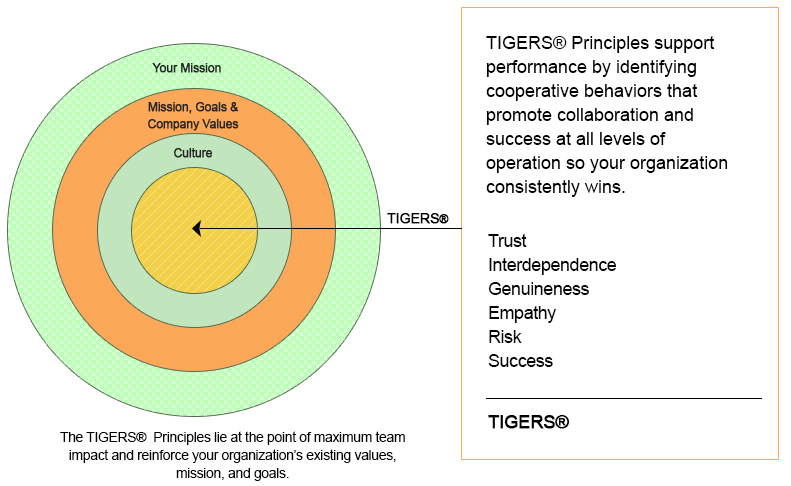 A process for recognizing teams that cooperate with one another and teams that achieve success milestones so that employees experience early successes. Without first getting your employees on-board by increasing their understanding and showing them how to integrate it, change will be resisted. It slows progress. It also weakens the business and business relationships. Once your organization has identified change-initiatives, reward your champions. To promote a strong culture, it’s important to focus on your company’s core values and those employees that demonstrate them. During change, double down on your company’s values because employees want to know that they work for a higher ideal than just making money. People may define values differently. As a company, clarify your core values to ensure everyone has the same understanding of what you view as important. Then, take the time to recognize and acknowledge team members who put those values into action. That way, others will see what values in action look like and will be encouraged to demonstrate those values as well. Humans are creatures of habit, and change can be hard for anyone to handle. This is especially true when it is sudden or unexpected but necessary. In order to survive the ever-changing work environment, organizations must be innovative and adaptive in order to keep up. To ensure your change strategy is successful, get your employees on-board. With understanding, employees can become excited for the process. Likewise, employees do better when they feel as if they have some control over the situation in order to be successful. That means knowing how and why change is happening. Rewarding your champions who are demonstrating your values. By getting employees involved and on-board, you will ensure successful initiatives. Engagement, Retention and Growth Crampton, Dianne. Championing Change, pg. 7-19. Three Creeks Publishing (2012).